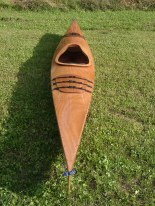 -The kit: I went with Chesapeake Light Craft and I have been very pleased with both their product and customer service, but here are the major competitors (that I know of): Pygmy Boats, Roy Folland Boats. -A workspace at least 3 feet longer and 6-10 feet wider than the boat you are building. It should be well lit and covered though it does not have to be enclosed. If you don't have such a space available, I should think that you could build a structure that would work out of 1 x 2's and plastic tarps for not too much money. The ideal however would be an enclosed workshop with a thermostat. As for a work surface, I happened to have two eight foot long tables available to me. I then used wedges of wood under the boat as it took shape. The instructions tell you how to build saw horses to support the boat but I can't comment on how well that works. I have seen other sites where people used a combination of long skinny plywood tables to lay out the boat plus saw horses once the boat is taking shape. -A small amount of woodworking ability. Though most of the cutting is done for you, the step that involves planing the sheer clamps is somewhat technically challenging. You can easily teach yourself the necessary skills by playing around with scrap wood but I just wanted to point out that some level of wood working skill is necessary. The main skill you need throughout the process however is the ability to figure things out. The most expensive tool that I couldn't see doing without is a random-orbital sander. Mine cost $90 but it is a really good one (Porter Cable 333VS, "VS" is for variable speed, a very good feature to look for). Other than that you need about 30 clamps which will run you between $30 and $90 (or you can make them for less from 4" PVC piping but I have not tried this). You also need a hammer, an electric drill, a block plane, a screwdriver, pliers, wire clippers, a hand-saw, a saber saw (electric or not), safety glasses, a respirator (mine cost about $25), and, if possible, a blowtorch and old knife (for cutting nylon straps). For measuring you need a tape measure, an angle iron (for laying out the wood prior to gluing the scarf joints), and a yard stick. -About 75 pairs of disposable gloves. -Saran wrap for preventing pieces from getting glued together inappropriately. -Sanding discs (80, 120, 220 grit, I used about 60 discs in all, $24 worth). -Varnish (and paint if you want to paint any part of it). -High quality foam brush for applying varnish. -400 grit sand paper for wet-sanding in between coats of varnish. -3/8" line for grab loops (I used 6mm cord intended for rock climbing). Click here to go to "How long does it take?"